I LOVE shopping at Boots and Superdrug! Go Girl! High Five! We’d do some serious damage let loose in the same store! Aww, just the Hand Food or S&G in general? Oh no I loved reading this post – it’s always fun to know what other ppl buy. Also been wanting to try The santuary Scrub Salt soap! I really don’t rate the smell of Flake Away! But it does the job though so idk. I haven’t seen the ad, I’ll watch out for it! Oh, I like the smell.. it’s a bit “Soap & Glory” but I find them rather charming. Ahhh haven’t tried the fizzy tabs yet but the Wilkos varnish remover is intolerable! Stinks, stinks so bad and doesn’t actually remove my polish without scrubbing! Ooh, yeah. Everyone checks and everyone judges. Am I the only one who absolutely ADORES your duvet cover? I’m a sales assistant in Boots so I peek in baskets all day long! Sadly it is not as interesting as you may think, I mainly deal with old ladies and baskets of maxi pads, and middle aged women in my store have a weird thing for John Freida hair products. However it is very exciting when someone with a big basket of goodies comes up, especially when beauty products off the counters are involved! Hand Food smells awesome and is sooo mositurising! 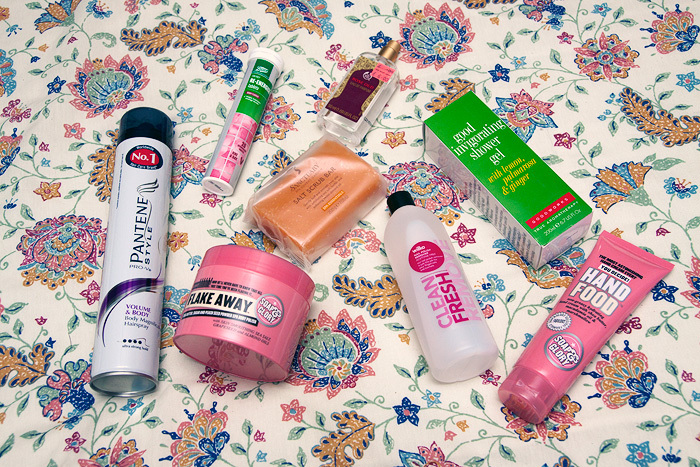 Boots and Superdrug are both amazing shops, you can find all sorts of bits and bobs in there. Everyone seems to be loving Soap and Glory’s Hand Food at the minute, I just can’t seem to find it anywhere! !